Order our “New Year, YOU Year” (Spring 2019) issue of Hungry Girl magazine before it’s gone! What can I expect to find in Hungry Girl magazine? ⭑ 60+ easy & delicious recipes! ⭑ Weight-loss success stories full of real-world tips & tricks! ⭑ Smart supermarket food finds! ⭑ And so much MORE! The Spring 2019 issue of Hungry Girl magazine is sold out in stores, but you can still order online! There are a limited number of copies left, so act fast. How do I order it online? Click here to order the Spring 2019 issue. You’ll have the option to purchase one for yourself, one for a friend, or both. (Psst… They make great gifts!) Orders will ship in 2 - 4 weeks, and shipping is free. Can I order a yearly subscription? We do not offer a subscription option at this time. By popular demand, our mag is available for digital download. You can order the Spring 2018 and Summer 2018 issues from Barnes & Noble and access them via your Nook tablet or the free Nook app (which works on tons of devices)! Spring 2019 will be available soon. You can order Spring 2018, Summer 2018, and Spring 2019 on Zinio! I ordered the Spring 2019 issue. When will my magazine arrive? Orders arrive in 2 - 4 weeks. If you have not received your magazine after 2 - 4 weeks, please email hungrygirl@cdsfulfillment.com for assistance. Why doesn’t the magazine cost less? Each issue costs $9.99. (Canadian price: $12.99.) Unlike most monthly magazine issues, these are high-quality keepsake editions. 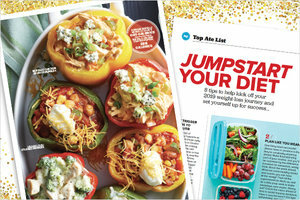 Each issue is packed with exclusive content and so many recipes! Where can I find the WW points values? 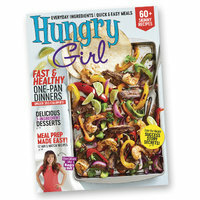 Spring 2019 Issue: Click here to download the Freestyle™ SmartPoints® values* for the recipes in the Spring 2019 issue of Hungry Girl magazine... the one with the fajitas on the cover! Summer 2018 Issue: Click here to download the Freestyle™ SmartPoints® values* for the recipes in the Summer 2018 issue of Hungry Girl magazine... the one with the sandwich on the cover! Spring 2018 Issue: Click here to download the Freestyle™ SmartPoints® values* for the recipes in the Spring 2018 issue of Hungry Girl magazine... the one with the mug recipes on the cover!